1. ASOS Turban Headband These headbands are my favorite way to keep my ears warm in the winter. It makes a great stocking stuffer for the fashionista in your life. 2. Nashelle Initial Disc Charm Monograms are everywhere lately (& I'm loving it! ), this is an unexpected take on the trend especially for a girl that has everything in her life monogrammed. 3. Tortoise Shell Bangles - Set of Three Tortoise shell is a neutral, meaning that these will make a perfect present for anyone. 4. Glitter Cateye Sunglasses in Gold Glitter Every girl loves a little sparkle, especially around the holidays & these chic shades will give her just that! 5. Fiercely Spotted Leopard Mitt Glove These gloves combine two huge trends right now: leather & leopard, add in the fact that they will keep the recipient's hands warm & you've got the perfect Christmas gift. 6. 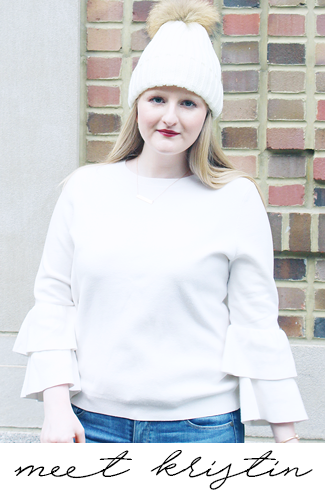 Kate Spade New York 'Ring' Wool Blend Gloves Everyone knows that getting engaged around the holidays is a big deal, gift these to the girl in your life who just got a ring on her finger so she can show off that she is engaged even when she has gloves on! 7. Rebecca Minkoff Kerry Pouch in Scarlett Give this to the girl in your life that straddles the line between naughty & nice, this pretty pouch will let her pick which she wants to be each day. 8. Lulu Faux Fur Infinity Scarf Infinity scarves are everywhere right now, & this faux fur one will make for a great gift. 9. Kate Spade New York Neon Bazooka Metro Watch Who wouldn't love to get a watch for Christmas? Bonus: The bright wristband on this one will add a pop to any outfit! 10. Kate Spade New York Small Square Studs These are super versatile & come in 13 different colors, meaning that you can surely satisfy any of the girls on your list with them! Will you be gifting any of these? That monogram necklace is SO pretty! I'd love to get any of these as a gift! Love the leopardy gloves, so adorable! I love 1, 2 and 8!!! I have been seeing that hot pink Kate Spade watch everywhere! Love! I love the sunnies and the watch! I am loving the accessories, especially the pink watch. So cute! 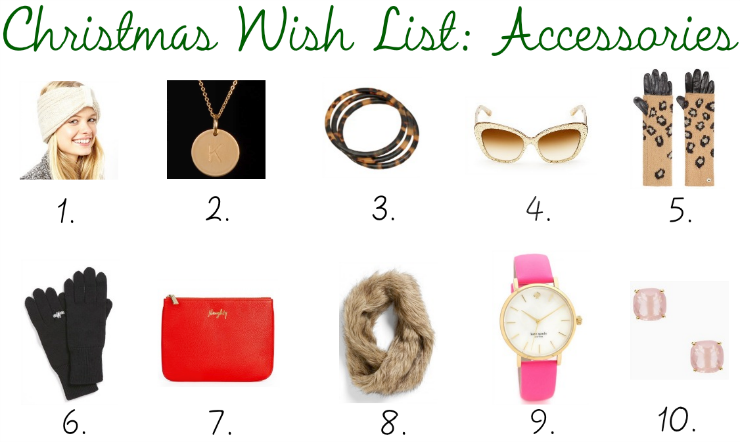 I'm loving this wish list!! this is great I can get some great gifts. I love those Kate Spade studs!